A Centre of Excellence in Textiles in Hawick will open early in the new year and will help to address business critical skills issues in the sector and provide industry skills of all levels. The project was awarded £610,000 from the Scottish Government via the South of Scotland Economic Partnership in July. The centre will be created at a former mill building in Hawick, and will be managed by Alistair Young, formerly Operations Manager at the town’s Peter Scott factory. Training will be provided to the town’s current textiles and knitwear workforce, with upskilling opportunities as well as advancing leadership and management skills. It will support the next generation by training 16 to 19 year olds in the practical elements of the textile and knitwear industry through Foundation and Modern Apprenticeships. Future development will increase the range of support facilities available to the textile sector. “I am delighted that we are able to fund this development through the South of Scotland Economic Partnership. The south of Scotland is renowned for the quality of its textiles industries and it is important that we invest in that excellence for the future. “This initiative will address business critical issues in the local textiles and knitwear sector and provide a stream of skilled young workers across all roles, enabling the world renowned Borders businesses in this sector to address succession planning issues and reduce or remove the need to send work overseas. “The Centre of Excellence in Textiles in Hawick is one of the eight projects funded to date and the news the centre is opening early next year is another exciting milestone for the partnership. “This is a fantastic project that supports the local textiles and knitwear sector and addresses a challenge that many of us have faced for a number of years. 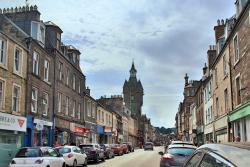 The location of the new Centre of Excellence in Textiles in Hawick is due to be confirmed in the coming weeks. The long term vision of the project is to develop, in addition to the training centre, a textile innovation centre as well as a showcase and marketing tool for the local industry. “This centre of excellence is a great example of partnership working in one of our regions, and I’m sure the communities of the south of Scotland will soon reap the benefits – from providing skills and training at all levels to enabling business growth and boosting the local economy. “As a partnership between Scottish Borders Council, the enterprise and skills agencies and the textiles industry, this centre of excellence will play a key role in identifying and addressing the skills needs of the sector.